The self-adhesive waterproof membranes of the ADERIX range, represents a technologically advanced solution for the application without the use of a torch flame. 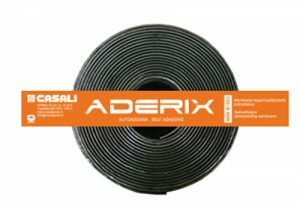 Casali Aderix polymer bitumen membranes are made of “dual compound ” APP / self-adhesive and SBS / self-adhesive. The combination of two important factors: the innovative Casali production technology and this special high performance self-adhesive compound, provides the appropriate combination of specialised bitumen and elastomeric polymers to create a tack enhancing resin, which is able to maintain strong, adhesive power over time. This advanced technology makes it possible to optimize the adhesion characteristics of the bituminous membrane by concentrating the self-adhesive compound on the surface to be applied; the media used in solid-state polyester filament yarn stabilized with glass wires adds to the products exceptional mechanical performance and remarkable dimensional stability. The base of the waterproof membrane has a removable silicone polyethylene film. Casali Aderix Waterproof Solutions are ideally suitable for flat or sloping roofs with wooden planks or heat-sensitive, heat-insulating materials, and in situations where a naked flame is prohibited. The application of these membranes, besides being devoid of flame-related risks, is simple, clean and environmentally friendly, as it does not develop fumes and smells. Aderix waterproofing membranes with polyethylene film finishes are used as a substrate for protecting thermosetting surfaces. The slate versions, in particular, represent the ideal waterproof solution as a final finish or as a membrane undercut when working on prefabricated wooden covers.